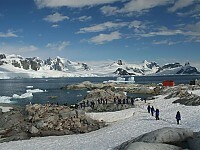 Antarctica has hosted a century of expeditions and exploration, from Roald Amundsen to modern races to the South Pole. These visits have been popularized in books and movies. Long the purview of scientists and adventurers, Antarctica is seeing a new type of visitor � the adventure tourist. Tourism to Antarctica arguably started in the 1970s. When a New Zealand airplane filled with tourists crashed into Mt. Erebus and all 257 people on board were killed. Tourism was halted for nearly a decade. In the 1980s, about 2,000 visitors a year arrived in Antarctica. A decade ago, most tourists to Antarctica comprised of retirees resting on cruise ship decks, watching the glaciers, penguins and occasional whale. They rarely set foot on land. The few who did go on land took pictures of the ice fields and penguins. They visited historic sites like old whaling stations or research stations. McMurdo Station is the largest settlement on the continent. It has been built to handle up to 1,200 people. In contrast, New Zealand's Scott Base only sleeps 90 people. They are scientific research stations, but both sites host tourists and have gift shops. Tourism dropped in the years since the 2007 financial market collapse, when the number of tourists peaked at 46,000. The number bottomed out at about 27,000 visitors. Cruise ships still pass through like the two cruise ships that regularly visit Ross Island. About 9,900 visitors travelled through Antarctic waters last year. However, tourism has rebounded. Furthermore, the nature of the tourism has changed. Tourists are coming onto shore en masse. Flights over Antarctica resumed in the 1990s. And in a growing number of ventures, tourists are scuba diving through the pristine waters and under ice, driving across glaciers and even sky diving and paragliding. You can now go water skiing off Antarctica or take two and three person submarines into the frigid waters. The submarines are owned by Henry Cookson Adventures. However, most tourists stay on the 2% of the continent that is ice free. International Association of Antarctic Tour Operators estimates that when the November through March tourism season ends, about 35,000 people would have visited Antarctica. Most tourists visit during the 17 week long summer when the sun never sets. Even more visitors are expected next year. In contrast, there are only 4,400 researchers stationed at the 39 different research facilities scattered across Antarctica. Anywhere else in the world, so few visitors would be described as a slow venue. On a place previously untouched by humans, every visitor has a profound impact on the otherwise unspoiled continent. Exotic species have become a problem to ecosystems as diverse as the coral reefs of the Caribbean to the rain forests of Hawaii. There are concerns that tourists could bring diseases or seeds that could disrupt the fragile Antarctic ecosystem. Then there are endless horror stories of groups coming closer to animals than rules allow. Tim Jarvis, an adventurer who recreated Ernest Shackleton's journey, filed complex environmental impact statements before making his journey. He is one of the few adventurers to take such care before starting out on his trip. While the fifty countries that have signed onto the Antarctic Treaty have decided to set rules to manage tourism, only two rules have been agreed upon to date. And as is often the case with international treaties, neither rule is actively enforced. Tourism has always had risks. Three skydivers above the South Pole station died in 1997. Hypoxia is the most likely cause of their deaths. However, hypoxia also creates risks for all visitors to the ice shelf. The South Pole is 9,300 feet above sea level, as high as many mountains. Antarctica is dry, cold and windy. There are many fatalities due to accidents caused by white out conditions. The last known fatalities were in 2011, when a yacht carrying three people disappeared during a squall. These risks are magnified in a land that lacks Emergency Rooms and ready evacuation to intensive care. A 2004 agreement to require tourism operations to have sufficient insurance to pay for rescue operations has only been ratified by 11 nations. There have been deaths. A Japanese crewman died in a shipboard fire in 2007. Searchers are often delayed until October to be able to recover the dead, such as three Canadians who died in January. Human visitors also introduce risks to the wilderness itself. Every ship is a possible oil spill. In light of this hazard, the UN prohibited the use of heavy fuel oil near Antarctica. This is one of the two hard rules in Antarctica. Unfortunately, many tour ships dump bilge water into the ocean. Plane crashes cause both toxic chemical spills and a form of litter. This is in addition to the noise pollution ships, vehicles and even aircraft bring, affecting everything from the penguins to the whales. There is a proposal to limit ships to a maximum of 500 tourists, but only Japan and Uruguay support it. The Polar Code would require all ships in the Antarctic to be strong enough to withstand sea ice, but this standard probably won't go into force until 2014. The beauty of Antarctica is its rugged and pristine vistas, wildlife and untamed and barely charted seas. It is not surprising that so many want to see it themselves. Yet we must do more to protect the land so that it remains so, or Antarctica as the last unspoiled wilderness will be no more. Crystal Cruises is planning a magical winter wonderland holiday with a new Antarctica Christmas/New Year�s cruise. In addition to three days sailing Antarctic waters, the December 21, 2013 Buenos Aires-Valpara�so voyage aboard the award-winning Crystal Symphony sails through Argentina, Uruguay, Chile, Falkland Islands, Drake Passage, Cape Horn, and the Chilean Fjords, with multiple excursions to the Antarctic continent. Generous booking savings are available until August 30 for the unique voyage � the only one of its kind for 2013 and 2014. All-inclusive cruise fares begin at US$9,740/person for South America and US$7,430/person for the Caribbean and include US$600 and US$800 per person in savings, respectively, if booked by August 30. Moreover, for a record 18th consecutive year, Crystal Cruises was voted the �World�s Best Large-Ship Cruise Line� in the Travel + Leisure 2013 World�s Best Awards readers� survey. Recognized as a T+L Hall of Fame winner, Crystal is the only vacation experience � cruise line, hotel or resort � to have been voted #1 every year since the awards� inception. Crystal Cruises� 2013 World�s Best Score of 90.10 is one of the line�s highest ever scores. Port Hardy, being the Northernmost city on Vancouver Island, is a natural marine gateway to the Inside Passage, which is why the ferry to Prince Rupert is such a popular option. The Inside Passage, geographically speaking, spans a vast stretch of seacoast from Seattle to Siberia, that's dotted with islands and awesome in its beauty. There are the San Juan and Gulf Islands, Queen Charlotte Archipelago and Aleutians for starters, plus Vancouver Island, which is bigger than many European nations. At one time, our family considered the Inside Passage an annual commute, heading 'outside' from Dawson City, Yukon via Skagway and the Alaska Panhandle ports of Juneau and Ketchikan, and Prince Rupert. The final stop en route to Vancouver was Alert Bay, near Port Hardy on the Northern tip of the biggest "Adventure Island" -the one named for Captain Vancouver. The final stop en route to Vancouver was a native community at Alert Bay, near Port Hardy on the Northern tip of the biggest "Adventure Island" -the one named for Captain Vancouver. Pick any direction - North to the fabled Haida Gwa'ii (Queen Charlotte Islands) and Alaska; east to the Central Coast and Cariboo Chilcotin; down Island to Campbell River, west to Cape Scott and across the seas to Asia Pacific ports. Port Hardy airport is a stone's throw from the Inside Passage, and BC Ferries offers sailings to Prince Rupert and the Central Coast. As Northern terminus of the new Island Highway, Port Hardy is home base for a variety of circle tours, like the one we enjoyed this summer. For flight- seeing, few vistas compare with the 45 minute Port Hardy jaunt, along the Inside Passage, soaring with an eagle's eye, as the Princess Love Boats glide by, and whales frolic beneath our wings. Coho Country: Port Hardy is where mining and logging history was made. A local event, "Fi-lo-mi Days," salutes the big three money earners; fishing, logging and mining. Known as "Coho Country", Port Hardy is famous for superb salmon fishing, and fresh water lakes and rivers where steelhead thrive. Mayor Hellburg showed us the new sea walk along the harbor, next to a large marina, which attests to the size of the local sports fishing industry. Over 400 charter boats operate from this scenic port . Whale watching is a huge draw; pods of whales travel through Johnstone Strait daily, to feed, and to visit special beaches, where they sink to the ocean floor and rub against rounded stones. A short ferry ride from Port McNeill takes you to Alert Bay on Cormorant Island, with the U'mista Cultural Center's treasure of aboriginal potlatch artifacts, one of the world's tallest totem poles, traditional Big House, the 'Namgis Burial Grounds-site of memorial and other Totem Poles, Alert Bay Library-Museum, Alert Bay Ecological Park, century old Anglican Church, ect. Another ferry serves Sointula, a Finnish fishing village on Malcolm Island. Check out Cape Scott Wilderness Trail, North Coast lighthouses, the old whaling station, Stories Beach, salmon farms, Quatse River Nature Trail and Port Hardy Fish Hatchery. For native culture, there's the Kwakiutl Long House, Indian. Other nearby place names include Sayward, Woss, Nimpkish, Zeballos, Fair Harbor, Cape Scott, Coal Harbor, Winter Harbor and Port Alice. Locating a business or buying a retirement home? You'll find serviced land a fraction of the cost of similar property on Southern Vancouver Island or BC's Lower Mainland. Port Hardy Airport Information: 250-949-6424, fax 250-949-9013. Port Hardy to Bella Coola, Central Coast and Cariboo- Chilcotin on BC Ferries Discovery Coast Route. I call them the "Adventure Islands," because the North Pacific coast and archipelago have long been a magnet for adventurers and soldiers of fortune, including my father, who left the family's Seattle home for a post with the Royal Canadian Mounted Police at Dawson City in the far Klondike. As for the Inside Passage, the Yukon's poet laureate, Robert Service, captured its majesty in his 'Songs of a Sourdough', Jack London immortalized it in Call of the Wild, and Pierre Berton chronicled it in his book Klondike. .BC Nature-Ecology: BC and the Yukon combines the geography of many lands, from desert to seacoast and alpine meadows. Its native culture goes back thousands of years. Photo: Ken Bird, Calgary. Port Hardy Links:. http://PortHardyLinks.com .